Although most often named “Call Bets” technically these bets are more accurately referred to as “announced bets“. The legal distinction between a “Call Bet” and an “Announced Bet” is that a “Call Bet” is a bet called by the player without him placing any money on the table to cover the cost of the bet. In many jurisdictions (most notably the United Kingdom) this is considered gambling on credit and is illegal. An “Announced Bet” is a bet called by the player for which he immediately places enough money to cover the amount of the bet on the table, prior to the outcome of the spin / hand in progress being known. This is a name, more accurately Grand Voisins du Zero, for the seventeen numbers which lie between 22 and 25 on the wheel including 22 and 25 themselves. The series is 22,18,29,7,28,12,35,3,26,0,32,15,19,4,21,2,25 (on a single zero wheel). This is the name for the twelve numbers which lie on the opposite side of the wheel between 27 and 33 including 27 and 33 themselves. The series is 27,13,36,11,30,8,23,10,5,24,16,33 (on a single zero wheel). 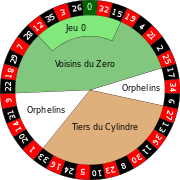 The full name (although very rarely used – most players just call it as “tier”) for this bet is “le tiers du cylindre” (translated from French into English means one third of the wheel) because it covers twelve numbers (placed as 6 splits), which is as close to 1/3rd of the wheel as one can get. Very popular bet in British casinos. Tier bets out number Voisin and Orphans bets by a massive margin. A variant known as “Tier 5,8,10,11” has an additional chip placed straight up on 5, 8, 10 and 11; and so is a 10-piece bet. A complete bet places all of the inside bets on a certain number. Full complete bets are most often bet by high rollers as “Maximum Bets”. Most typically (Mayfair casinos in London and other top class European casinos) with these “maximum” or “full complete” bets nothing (except the aforementioned maximum button) are ever placed on the layout even in the case of a win. Experienced gaming staff, and the type of customers playing such bets, are fully aware of the payouts and so the croupier simply makes up the correct payout, announces its value to the table inspector (floor person in the USA) and the customer, and then passes it to the customer, but only after a verbal authorization from the inspector has been received. Also typically at this level of play (house rules allowing) the experienced croupier caters to the needs of the customer and will most often add the customer’s winning bet to the payout, as the type of player playing these bets very rarely bets the same number two spins in succession. For example, the winning 40 piece / $40,000 bet on “17 to the maximum” pays 392 pieces / $392,000. The experienced croupier would pay the player 432 pieces / $432,000, that is 392 + 40, with the announcement that the payout “is with your bet down Sir”. There are also several methods to determine the payout should a number adjacent to a chosen number be the winner; for example, player bets 40 pieces on “23 to the maximum” and number 26 is the winning number. The most notable method is known as the “station” system or method; roulette dealing at this level is very complex and the exact methods are beyond the scope of this article – suffice it to say that a “good experienced croupier” would have no problem working with “stations”. In some casinos, a player may bet full complete for less than the table straight-up maximum; for example, “number 17 full complete by $25” would cost $1000, that is 40 pieces each at $25 value.